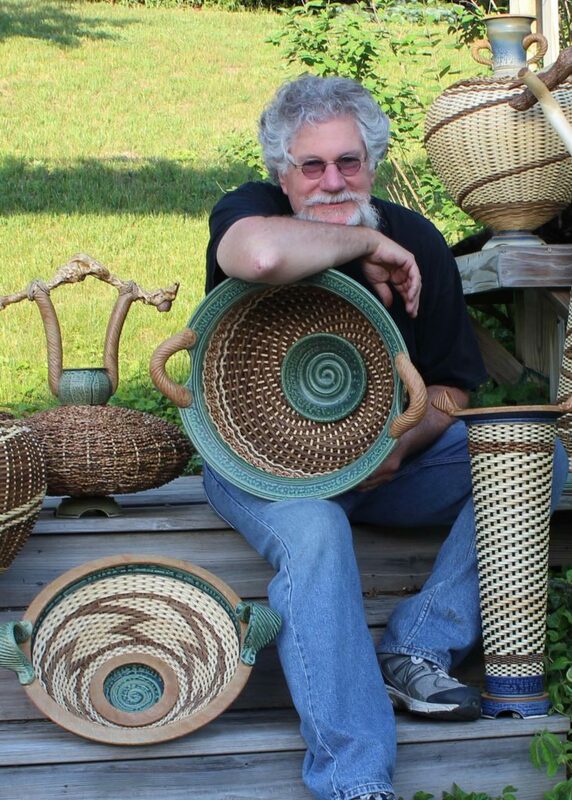 After completing my BFA at Adrian College in 1976, and then working as a studio potter for fifteen years, I decided that to create the mixed-media baskets you see here. Unhampered by the limitations found with clay-only forms, texture, color, shape I have created a form that combines many interesting materials to create very unique works of art. To create these forms I use (reed), clay and wood. The challenge here is to have a clear vision of the completed basket before starting the piece. Using traditional wheel-throwing and hand building techniques, I finish the clay parts first. Once I have completed that I position and glue reed, dowel, or ash spokes in place. This stabilizes the form for weaving. The final process is the weaving. I select the natural or smoked reed and weave plaited and twilled patterns. I will often choose palm, vine rattan, or birch bark as accents to add a more natural feel and texture to my baskets. Breaking from the clay-only vessel and exploring the endless possibilities afforded by basketry as an art form has allowed me to explore shapes and textures that were unattainable to me in the past.